The dragonmen have taken Solace. Its beautiful tree houses lie black and battered amid the stumps of great vallenwood trees. Kapak Draconians, armed with poisoned weapons, enforce a brutal martial law on the survivors. And Solace is only one outpost: the dragon armies control the plains. Only the elven kingdom of Qualinesti stands unconquered. The rest of the plainsmen suffer the most: a long slave caravan hauls hundreds of them to the fortress prison of Pax Tharkas. 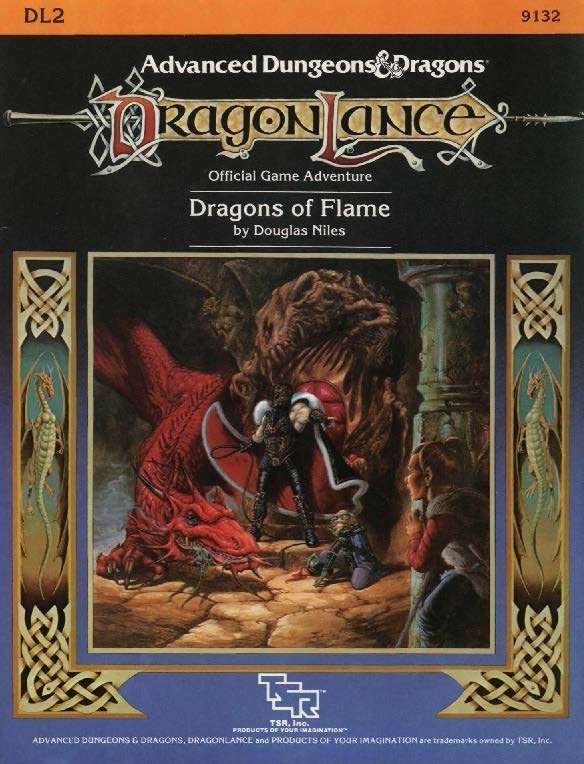 "Dragons of Flame" is the second in TSR's series of Dragonlance adventures for use with the AD&D game system. Your players will adventure in the world of Krynn and visit strange places such as Qualinost or the Sla-Mori, encountering bizarre draconians and disgusting Aghar. They can play the modules as a set of separate adventures or as a great quest that spans the entire Dragonlance story. DL2: "Dragons of Flame" (1984), by Douglas Niles, is the second in the Dragonlance Chronicles series of adventures. It was published in July 1984. Continuing the "DL" Series. "Dragons of Flame" continues the "DL" series as the second of twelve epic adventures; it progresses directly on from the cliffhanger at the end of DL1: "Dragons of Despair" (1984). Dragon of the Month. Dragonlance was originally designed as a series that would spotlight one sort of dragon in each adventure — though it later expanded well beyond this mandate. This is clearly the red-dragon adventure, but author Niles makes sure that it's not just a kill-the-dragon quest. In fact, there are two red dragons in "Dragons of Flame" and they're integral to the plot. One is the mount of archvillain Verminaard while the other is the somewhat crazy guardian of the child hostages in Pax Tharkas. The PCs aren't actually expected to kill either — though the two will fight each other at the end if the module is run according to plan. Red dragons remain important throughout the first Dragonlance arc running from DL1-DL4 (1984) — thanks to Verminaard and his Red Wing of dragons. They were presumably picked for this role because red is a nice autumnal color. Their importance was also reflected in the original printing of the novel, Dragons of Autumn Twilight (1984), which had a red border. Adventuring Tropes. As with all the "DL" adventures, this is a plot-heavy module, which was very unusual for its time. According to this plot, the Companions are captured, enslaved, and freed before they explore the citadel of Pax Tharkas — which is a more typical dungeon crawl. The storyline is advanced differently in "Dragons of Flame" than in its predecessor, "Dragons of Despair". The first 25 encounters, which take up more than half the adventure, are all events that players must resolve as they move through the adventure's main plot. A few adventures had lightly used events of this sort prior to "Dragons of Flame", but the number of them in "Dragons of Flame", and the way they're used to shape a complete narrative, was unprecedented. One other new feature in "Dragons of Flame" is its use of "NPC Capsules", which provide complete stats for NPCs and some background on who they are. They’re also easy to find thanks to the use of a shaded box. This level of attention to NPCs was unusual for the period; just a few years’ previous in adventures like T1: "The Village of Hommlet" (1979), NPCs didn't even get names! A Different Sort of Handout & Map. As with its predecessor, "Dragons of Flame" has interesting player accessories. There's another song, the "Elven Hymn”, and the map is again isometric and shows interconnections between levels. Neither of these accessories is used as well as the similar features in "Dragons of Despair", but their mere existence is worthy of note. The Novel Connection. "Dragons of Flame" is adapated on pages 268-432 of the original printing of Dragons of Autumn Twilight (1984), the first Dragonlance novel. The early events are dealt with quickly, but once the Companions enter the tunnels leading into Pax Tharkas, you can again track their journeys room-by-room on the maps in "Dragons of Flame". However, the novel begins to move away from the adventure in the final two chapters. Dragons of Autumn Twilight kills off Verminaard and his dragon Ember, where they survive in "Dragons of Flame" to bedevil the Companions in the next two adventure modules. There's a good reason for the difference: the original trilogy of novels largely skips the events of DL3: "Dragons of Hope" (1984) and DL4 "Dragons of Desolation" (1984) — though Hickman and Weis came back to adapt them years later in Dragons of the Dwarven Depths (2007). Expanding Krynn. "Dragons of Flame" moves slightly south in its exploration of Abanasinia to introduce the elven land of Qualinesti and the fortress of Pax Tharkas — the so-called "Citadel of Peace". This was the first look at these lands and also the first look at Qualinesti elf culture. Monsters of Note. The kapak draconians appear for the first time in this adventure. About the Creators. Niles was a member of the Dragonlance design team who would come back to author three more of the adventures in the 12-book series, including the climatic DL14: "Dragons of Triumph" (1986). He also coauthored DL11: "Dragons of Glory" (1986), a sourcebook and wargame, with Tracy Hickman. I'm wondering what the update was to this? It shows in my library, but says "Updated!"